Loew’s Yonge Street Theatre, designed by Thomas W. Lamb, opened December 15, 1913, as the Canadian flagship for Marcus Loew’s American vaudeville chain. Above it, a second “stacked” venue, the Winter Garden Theatre, opened February 16, 1914, modelled after 19th-century “roof garden” theatres. With the decline of vaudeville and the rise of motion pictures, the Winter Garden Theatre closed on June 16, 1928. For fifty years it sat dark and empty, coming to life only twice, for a midnight preview of a Vincent Price movie, and during the filming of the CBC’s White Oaks of Jalna series. The downstairs theatre was wired for sound and adopted a movies-only policy in 1930. It was the location for the Canadian premieres of Gone With the Wind and The Wizard of Oz. In 1960, renovations to the downstairs theatre to accommodate Cinemascope screenings led to removal of the original opera boxes, orchestra pit and proscenium arch. In 1969, Loew’s sold its Yonge Street and Winter Garden theatres, along with Loew’s Uptown Theatre, to Canadian theatre mogul Nat Taylor. With the loss of mass movie audiences in the 1970s, many older, larger venues were either closed for good or divided up into multi-screen venues. The Yonge Street Theatre, renamed the Elgin Theatre in 1978, managed to avoid such a fate, surviving for another decade by becoming a popular second-run movie house. However, by 1981, it too succumbed. Faced with a number of outstanding work orders, it closed its doors. At this point, the province stepped in. Using Lottario funds, the Ontario Heritage Foundation purchased the Elgin and Winter Garden theatres and, in 1982, they were designated National Historic Sites. In 1984, the long lobby connecting the Yonge Street entrance with the theatres was fully restored in conjunction with the Toronto production of Cats, which ran from March 14, 1985 to March 14, 1987. The run of Cats proved both the viability and the shortcomings of the venue in terms of modern live theatre productions. 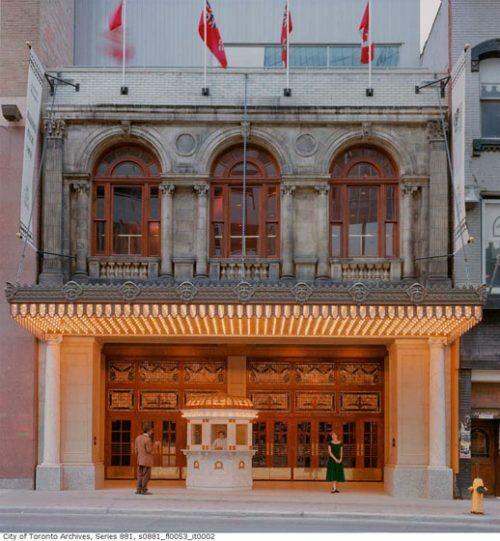 A two-and-a-half–year renovation and restoration period followed, the largest theatre restoration project undertaken in Canada, with Mandel Sprachman as Project Architect. On December 15, 1989, its 76th anniversary, the last remaining “double-decker” or “stacked” theatres in the world re-opened.